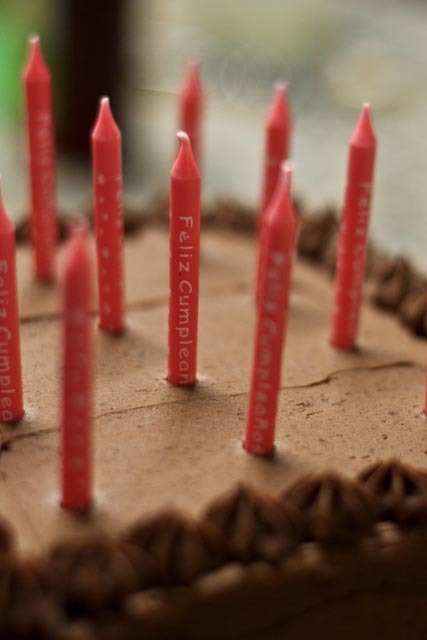 Feliz cumpleaños! My boyfriend’s birthday and my birthday are about 10 days apart, so each year I try to bake one cake for the both of us – because my waistline doesn’t need two cakes – and it’s usually of the chocolate variety (our favorite!). I actually baked this same cake for another friend’s birthday last year, and it was to die for, so I thought I’d make it again and share the recipe with you. This cake is super moist and decadent and is so rich and sinfully delicious that you almost can’t stop eating it. You’ve been warned. This is a three bowl cake. Two for your standard wet and dry ingredients, and a third for the cocoa and coffee mixture. Chocolate and coffee go so well together – it’s like they were made for each other – and the coffee only enhances the flavors of the chocolate. So delicious! This recipe calls for freshly brewed hot coffee, which I think is a must. 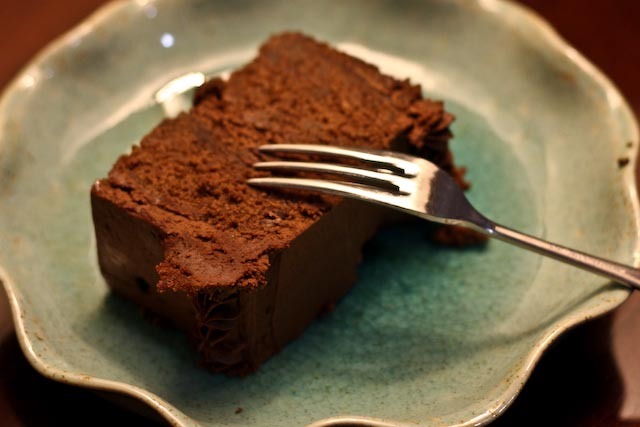 You don’t want to be using stale, cold coffee in your chocolate chocolate birthday cake, do you? Now that’s some cake batter! This time I chose to make a large sheet cake which I then cut into two square layers. The last time I made this cake I used two 9″ round cake pans, and that worked beautifully as well. 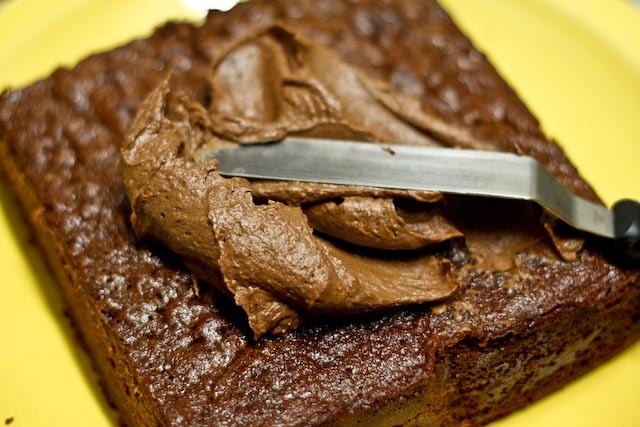 This is a very versatile chocolate cake! You could probably make some yummy cupcakes with it too! I chose to use parchment paper to prepare my baking pan (rather than the usually butter with flour/cocoa powder), so that I could more easily lift the cake out of the pan to decorate it. Either way works. 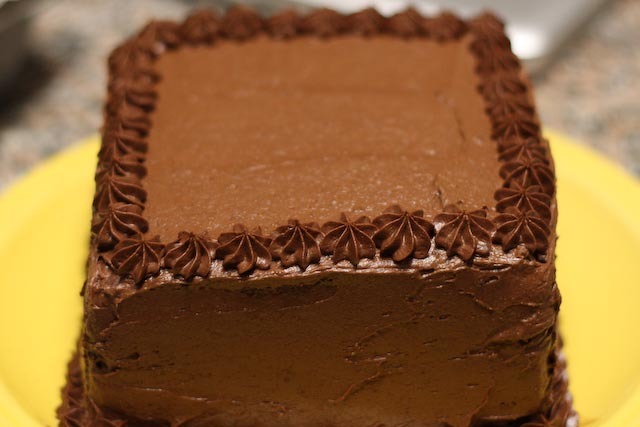 Heck yeah – chocolate buttercream! I trimmed the edges of the cake to make two squares and frosted each layer. Deliciously rich and chocolately to the very last bite. Make this cake for the birthday of someone special. They’ll thank you for it! Preheat the oven to 350°F. If making two round cakes, place racks in the upper and lower thirds of the oven, otherwise, a rack in the center of the oven will do. 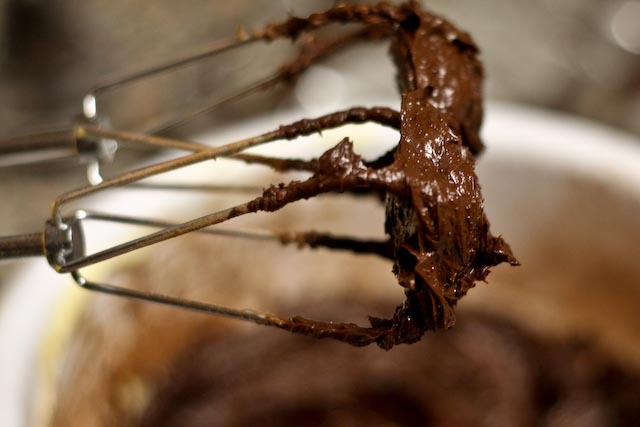 Grease the pan(s) with butter and dust with a little flour or cocoa powder. 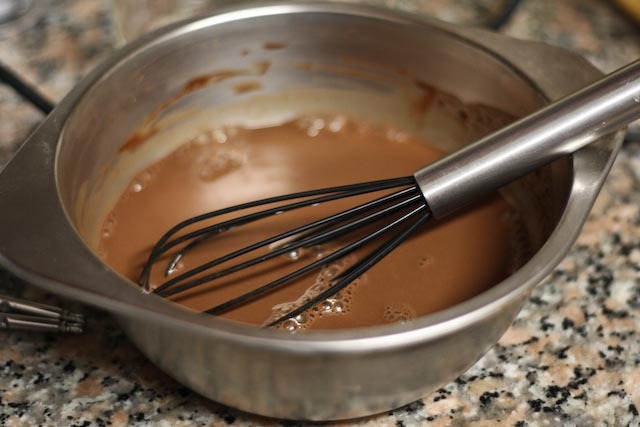 In a small bowl whisk together the hot coffee and cocoa powder until smooth, then whisk in the milk and vanilla. 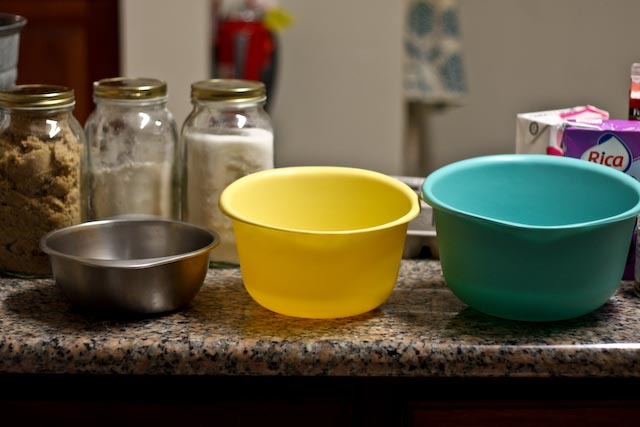 In a medium size bowl, whisk together the flour, baking soda and salt. Beat together the butter and both sugars in a large bowl using an electric mixer until pale and fluffy (about 5 minutes). Add the eggs, one at a time, beating well after each addition. Add in the flour and cocoa mixtures alternating in three batches, beginning and ending with the flour mixture. Pour the batter into the cake pan(s). 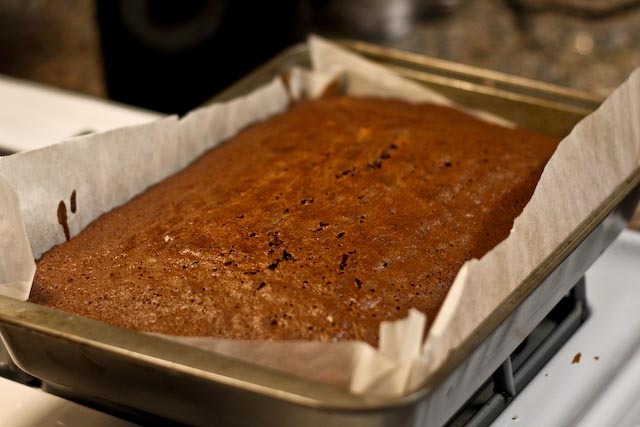 If using two cake pans, stagger the pans in the oven so one is not directly above the other. Bake, rotating pans, for 25-30 minutes for 9″ round cakes or 35-40 minutes for a 9″x13″ sheet cake. A toothpick inserted into the middle of the cake should come out clean. Let the cake(s) cool completely before frosting. 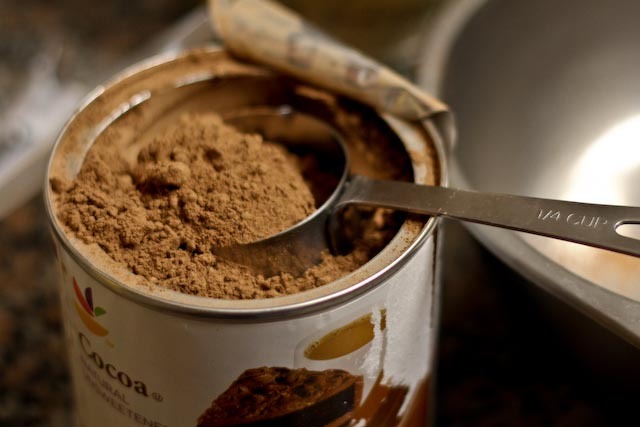 With an electric mixer, cream together the butter, cocoa powder and salt. Butter mixture will be very thick. 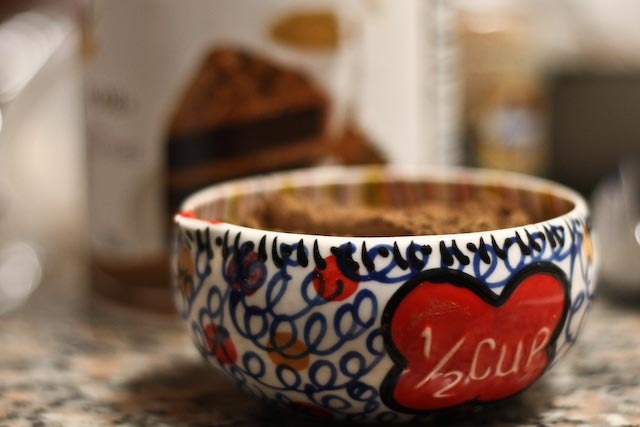 Scrape down the sides of the bowl and add powdered sugar and vanilla extract. Mix on a low speed. 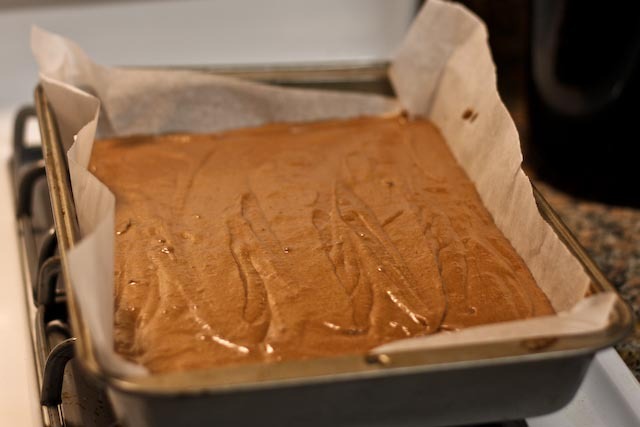 As the sugar incorporates, increase the mixer speed and beat the frosting until smooth. 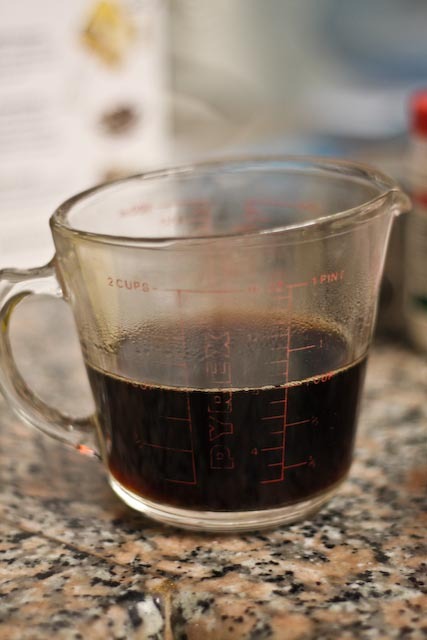 In a 1-cup measuring cup, stir together heavy cream and Ovaltine. 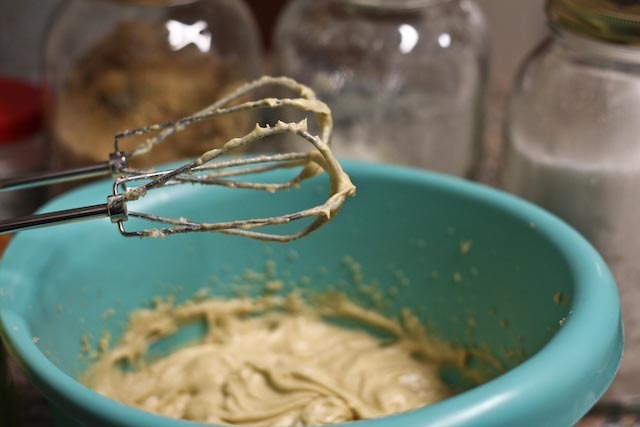 With the mixer on a medium speed, slowly pour the cream mixture into frosting until you have reached your desired consistency. Frost the cake, one layer at a time, and garnish with additional piped frosting or fresh berries. 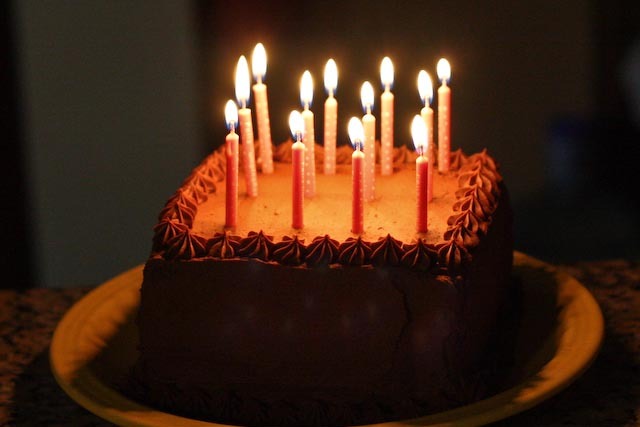 Nutrition Information: It’s birthday cake – who cares!? Nutrition information is my favorite part 😀 I can’t wait to try this recipe Larina! Riiiight up my alley with the chocolate and coffee. It’s a seriously awesome cake. I hope you like it!